The Green Word | News, information and opinions about environmental issues from Canada and around the world. On Sunday, April 28th, 2013, activist Bill McKibben was a guest preacher at his former church, the Riverside Church in NYC. During his sermon, McKibben made connections between religious values and climate change, corporate greed and the divestment of fossil fuel stock. Although I am not a religious person myself, I felt the sermon was excellent. Please take a look. According to a National Oceanic and Atmospheric Administration (NOAA) report, “the combined average temperature over global land and ocean surfaces for March 2013 tied with 2006 as the 10th warmest on record, at 0.58°C (1.04°F) above the 20th century average of 12.3°C (54.1°F).” That makes March 2013 the 337th consecutive month with temperatures above the 2oth century average. 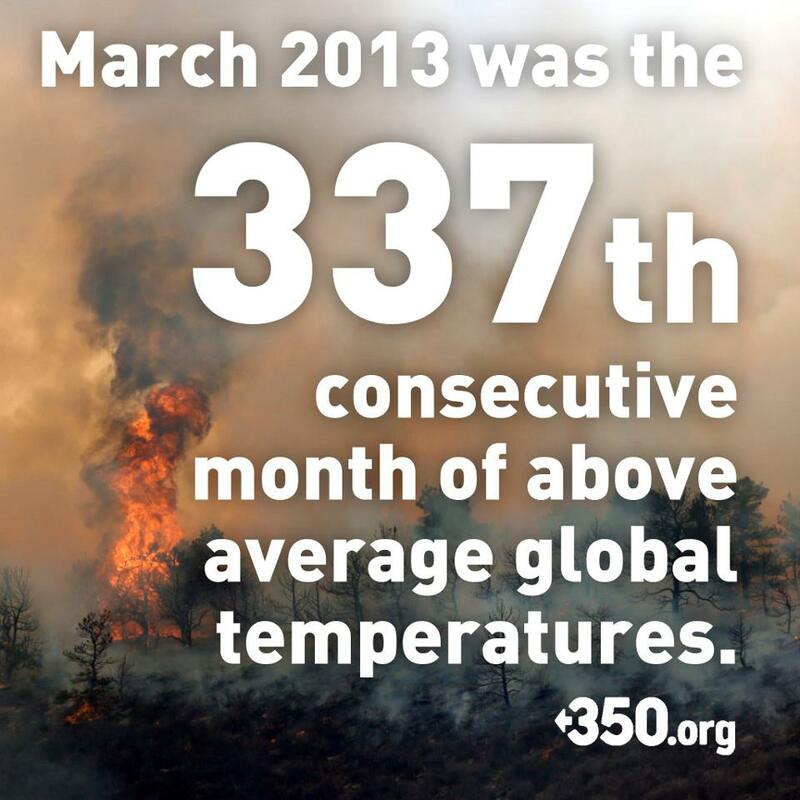 And so, despite the fact that North America had a rather cold and snowy March, the global warming trend continues. Here is a map that shows the weather and climate highlights for the month of March 2013. Climate change and oil spills have something in common. They do not get enough media attention in North America. 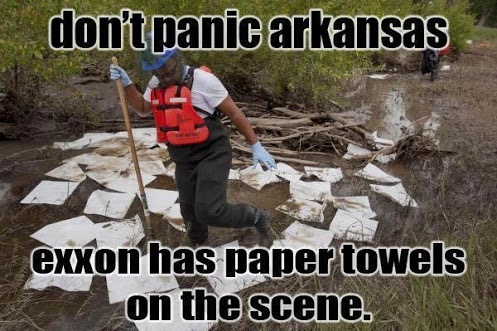 While the bitumen spill in Arkansas got its 15 minutes of fame, the reality is that oil and chemical spills are much more common than we realize. 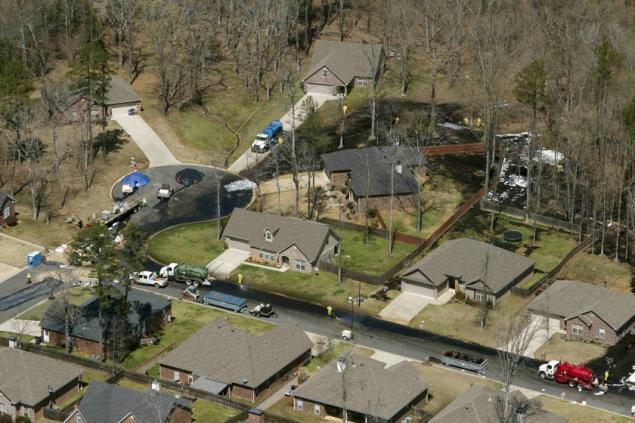 In fact, from March 11th to April 9th of this year, there were 13 significant spills, releasing more that 1,000,000 gallons (4,000,000 litres) of toxic chemicals. Take a look. Some of you may have noticed that I haven’t been posting much over the past 2+ weeks. It isn’t as though there has been a lack of events and news to post about. Rather, I’ve been keeping myself busy organizing two climate talks and helping a friend put together a blog about climate action. First, the climate talks. The first talk was supposed to be in front of five classes at a high school outside of Charlottetown (PEI’s capital). I say “supposed to be” because it didn’t happen – I got into a car accident on the way there. Luckily, no one was hurt, however, both vehicles have been badly damaged. The irony is that I hit the car of one of the teachers whose class I was on my way to speak to! The second talk will happen later this month and will be for the general public. I’ve already done two talks to the public in Charlottetown. However, this one will be the first in French. Also, I’m getting some really great help advertising for the talk so I hope that turnout will be good. Now, to the website. Well, technically, it’s just a blog… So, the blog is called “Climate Action – What political parties, environmental groups and citizens need to do”. The idea is to discuss constructive ways to get action on climate change. Beyond the actual post, we’ve put together four additional pages that can be accessed by the menu at the top of the page. The page titled “Earth Day Panel” gives information about a panel discussion occurring on April 22nd. The topic of the panel will be “A critical look at why political parties have not taken climate change action, what needs to change within the environmental movement and how do we create momentum for concrete action.” Speaking will be politicians and members of the environmental activism community. The page “Prince Edward Island Earth Week 2013” is listing of events occurring during the week of April 22nd. Next is “Climate Change 101” is a kind of “climate change for dummies” text that I put together. And the final tab brings you to several quotes about climate change from Canadian leaders. And just in case you don’t, I’d like to share with you something that we posted on “Climate Action”, that I believe is useful to anyone who would like to lobby politicians to take action on climate action: the top 7 “dos” and “don’ts” to influence your politician on climate change. As President Obama continues to ponder the fate of the Keystone XL pipeline (I’m sure it’s keeping him up at night! ), this past week saw two significant spills of Alberta Tar Sands oil in the US. 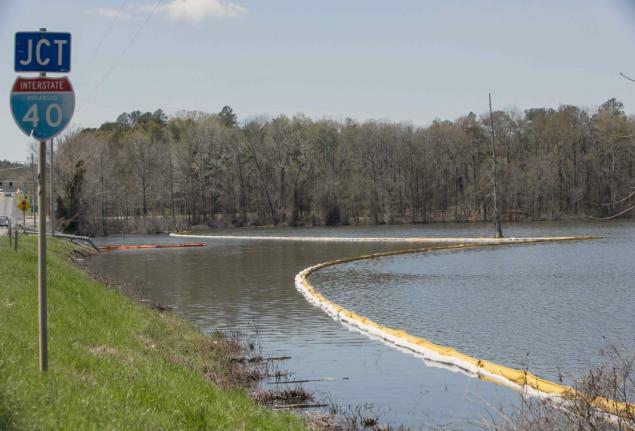 The first spill occurred on Wednesday, March 27th. 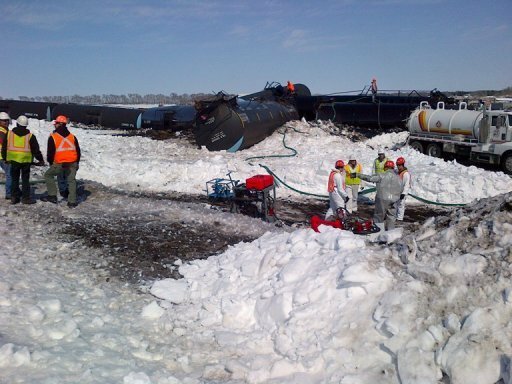 Fourteen cars (of a 94-car train) left the tracks, dumping 30,000 gallons (120,000 liters) of the gooey stuff. Apparently, tar sands bitumen shipment by rail has rapidly increased over the past three years as pipelines of the stuff are facing important public opposition. Interestingly, according to Reuters, this was the first major spill of the “modern North American crude-by-rail transition boom”. Makes you wonder: are pipelines really the safest way to move oil? Or is it simply the fastest (and hence the most profitable)? Train derailment. Photo: Minnesota Pollution Control Agency. 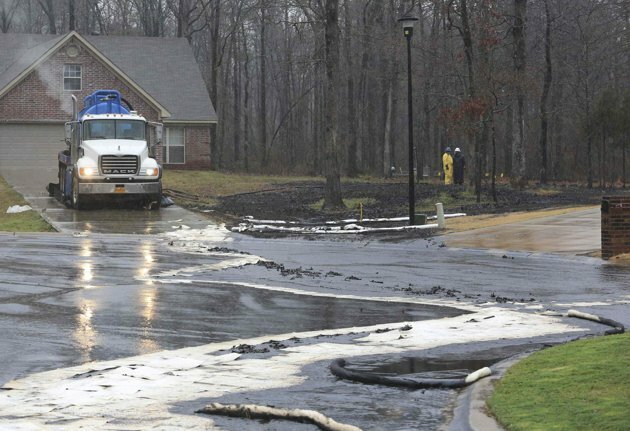 Cleaning up Tar Sands oil in Mayflower Arkansas. Photo: Reuters. 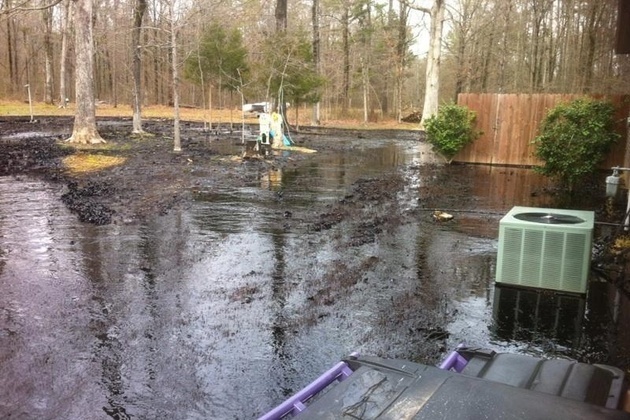 On an a side note, all of this occurred the same week that Exxon was fined $1.7 million for a pipeline that leaked 42,000 gallons (160,000 liters) in the Yellowstone Rive in 2011. This fine is pathetic in two ways. First, it works out to only $40 per gallon! Not bad considering the incalculable damage it must have done to the river ecosystem. 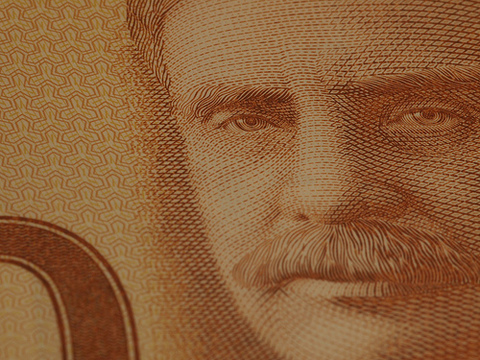 Second, $1.7 million is less than half an hour of profits for the oil giant. So, we’ll call that a very week slap on the wrist. For me, what all of this shows is that transporting oil, by which ever method you choose, is a dangerous process. You could argue that if the fines for spills were heavier, companies would have a greater incentive to make the pipelines (and trains) safer. However, as that is not likely to happen, we have to consider the fact that Tar Sands bitumen is not like other oils. The fact that it is heavier than water makes it extremely difficult to clean up. For proof of that, you only have to look to the state of Michigan. People there are still cleaning up the Kalamazoo River where more than a million gallons (4 million liters) of bitumen spilled back in July of 2010! Just one more reason why we should all be against the Keystone XL pipeline. The following was written by Bill Wareham and published on the David Suzuki Foundation website. $100 dollar bill. Image: Wilson Hui. It’s budget time, and we’re hearing a lot about deficits and declining economic growth. Like many Canadians, I’m worried that today’s federal budget is creating a hidden deficit that our children and grandchildren will have to pay for. The March 21 federal budget cuts programs that protect nature. This lack of support for environmental programs is drawing down on our natural heritage. We might not have to pay now, but the long-term consequences are serious. Canada is blessed with rich natural resources, an abundance of fresh water, bountiful farmland and oxygen-producing forests. But the 2013 focuses on how to exploit our natural heritage rather than sustain it. Canadians expect every level of government to look after our collective wealth, whether it’s in education, transportation infrastructure or national defence. When it comes to collective wealth, there’s nothing more important than the elements we depend on and share the most: our air, water, soils and biodiversity. These shared elements are what Canadians expect their governments to watch over and safeguard. Cuts to scientific monitoring cast doubt on whether we can make good decisions about our environmental wealth. If we don’t know what’s happening with fish populations, ocean acidity, rainfall and carbon emissions, how can we expect our governments to properly manage our most precious resources? This hidden deficit is most obvious when it comes to protecting our coastal waters. Canada has the world’s longest coastline but is a laggard, not a leader, when it comes to protecting it. “Conservation actions are not keeping up with the increasing pressures faced by our oceans,” is how Scott Vaughan, Canada’s Commissioner of the Environment and Sustainable Development, bluntly put it. What did government put in the budget to move forward the 20 proposed marine protected areas? A mere $4 million. The Green Budget Coalition, a respected umbrella group of environmental organizations, had suggested a minimum of $65 million to get these protection measures on the move. It looks like the priorities of Commissioner Vaughan the Green Budget Coalition are not the same as the federal government’s. However, there are priorities in the budget, including $57 million for “aquaculture renewal”, which in plain English means “help for fish farms”. Did the federal government forget about the findings of the Cohen Commission? Even if this budget were only about protecting our economy, the choices are wrong-headed. “Conserving and protecting marine biodiversity is not solely an environmental priority…[the ocean] is intrinsic to the health and functioning of the world economy,” Commissioner Vaughan said. It’s not surprising that he also has an economic perspective on marine biodiversity. He is, after all, in the office of the auditor general of Canada. Clearly, our magnificent and awe-inspiring blue planet has more value than any ledger can quantify, but even through the distorted lens of an economy-first perspective, safeguarding productive ecosystems must become part of the calculation when balancing a budget.